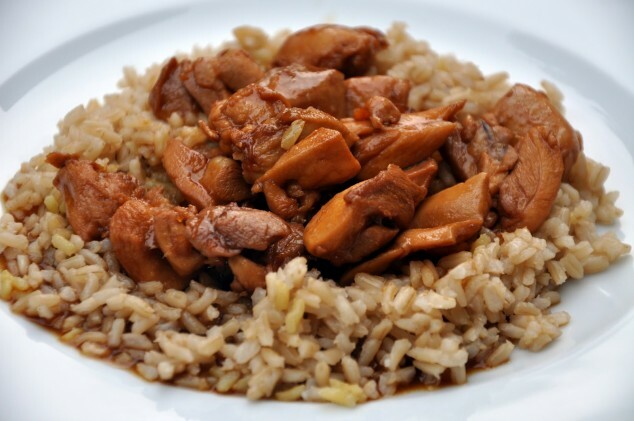 It took less than 30 minutes to prepare this rice and chicken in soy sauce. It’s simple and tasty with steamed rice and soft-boiled eggs, if you desire. In a medium bowl, combine the soy sauce, dark soy sauce, Mirin, Sake, chicken stock, and cornstarch. Set aside. Toss the chicken pieces with some salt and pepper. In a skillet or wok, stir-fry the chicken with oil and ginger over high heat until no longer pink. Mix in the soy sauce mixture. Bring it to a boil, add the onion, reduce the heat and simmer for about 10 minutes. Serve over rice, and top with soft-boiled eggs, and some chopped scallions.